Bob’s talk at our January meeting will be based on his book ‘Lewes through Time’, published by Amberley Press late in 2012. Bob will demonstrate how the streetscapes of Lewes have evolved in the last century, using postcard views from 100 years ago and contrasting these with modern equivalents carefully taken to replicate the original photographers’ perspectives. There are almost 200 photographs in the book, including many I am pretty confident you will not have seen before. Copies of the book will be available. We shall be serving coffee and biscuits prior to the meeting. As usual all will be welcome. Following the AGM, the entry fee for our talks will remain at £2 for members, but will be increased for £3 for non-members. 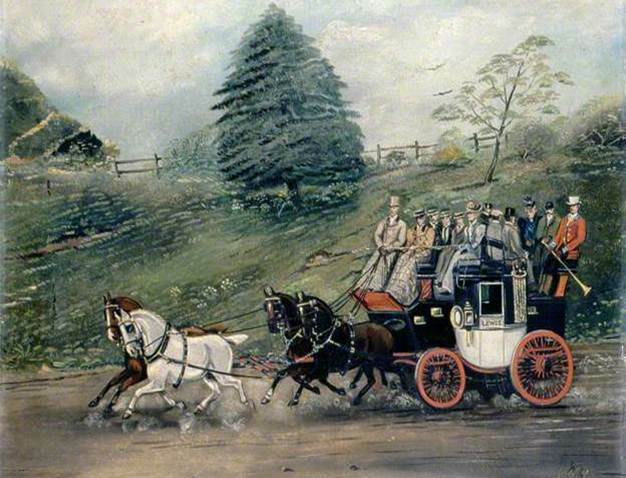 This oil painting by W.W. in the Brighton & Hove Museums and Art Galleries collection is dated 1896 (when the London-Lewes stage coaches had long been replaced by the railway). The Terms of Reference for the Lewes History Group, as printed in Bulletin no.29, were approved. These will be reviewed during 2013. It was agreed after discussion that the annual membership subscription should be £8 p.a. (£4 for a second member at the same address) and that the meeting entry fee should remain at £2 for members, but be raised to £3 for non-members. The committee was tasked to establish a mechanism to enable members not on email to receive paper copies of the Bulletin. We held 10 monthly meetings and 3 research group meetings this year. Five of our speakers were paid. Overall the £2 entry fees covered meeting costs almost exactly. The surplus of income over expenditure for the year was entirely due to the very successful Nevill ‘Street Stories’ meeting, which was attended by 141 people (mostly Nevill residents) and generated a surplus of a little over £200. Attendance at our other nine meetings averaged 50, and was always within the range 40-60. As part of a private, non-commercial project I am researching the history of an organisation called the Metropolitan Drinking Fountain and Cattle Trough Association. This charity was responsible for erecting drinking fountains and cattle/horse troughs in London, then across the rest of the UK, and even a few abroad. As part of this project I am trying to track down all the cattle/horse troughs that remain today. According to my research five granite troughs were erected in Lewes. The 1912 trough is still extant at the bottom of Watergate Lane (handy for the cattle market), and I’m 99% sure that the smaller trough nearby in Southover Grange Gardens is the one from Brighton Road (1886). There is also a trough at White Hill, but with the date 1887. Does anyone know whether this was originally on London Road, or whether there are any other cattle/horse troughs extant in Lewes? If you can answer these questions, please contact info@londontroughs.co.uk. As a life-long Lewes resident, I was fascinated by the postcard in the last Bulletin showing the view from Cliffe Hill, a location which was one of my favourites when I was growing up. Even when still at primary school in the mid 1950’s I could walk up Chapel Hill alone from my house in Morris Road, and while away school holidays looking down on the town. 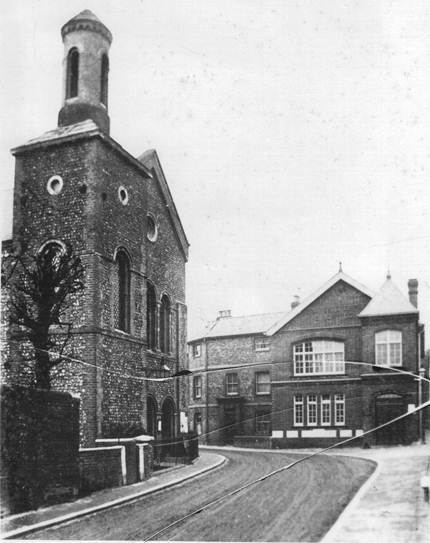 One of the buildings that can be seen in the photo is Eastgate Baptist Church on the corner of Little East Street and Eastgate Street (right on the right-hand edge of the photo below the Naval Prison). It can be seen with the quirky “pepper box” top to the tower, which was there from when the church was built in 1843 until the tower was rebuilt and a conventional pyramidal top fitted in 1915. I attach a print from a broken glass negative showing the church (pre-1915). 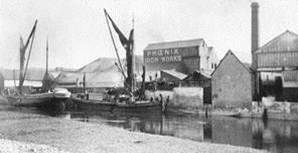 The church hall on the opposite side of the road, was pulled down when Phoenix Causeway was built. Susan Balfour was able to pass on the following information to Margaret Pokorny, following her query about the Southover Gallery [Bulletin no.28]. “The Southover Gallery was run by my late mother Deirdre Bland, later Deirdre Inman, from 1974 to 1987 as an outlet for local artists. The Duncan Grant drawing you own was in a very successful exhibition of 25 pictures. I bought a drawing myself. She showed some more of his work in October 1976. Some of the shows exhibited the work of two or three artists and sometimes she had mixed exhibitions, particularly before Christmas. Pottery was often shown as well as pictures. This 1785 print of St James Hospital was drawn by Francis Grose, engraved by L. Peake and then published by S. Hooper. The Hospital, originally part of Lewes Priory, is in Southover. Some remains are still to be seen, across the road from Southover Grange, next to the school car park. Visible in the background is St Anne’s church, standing proud on its isolated hillside location. 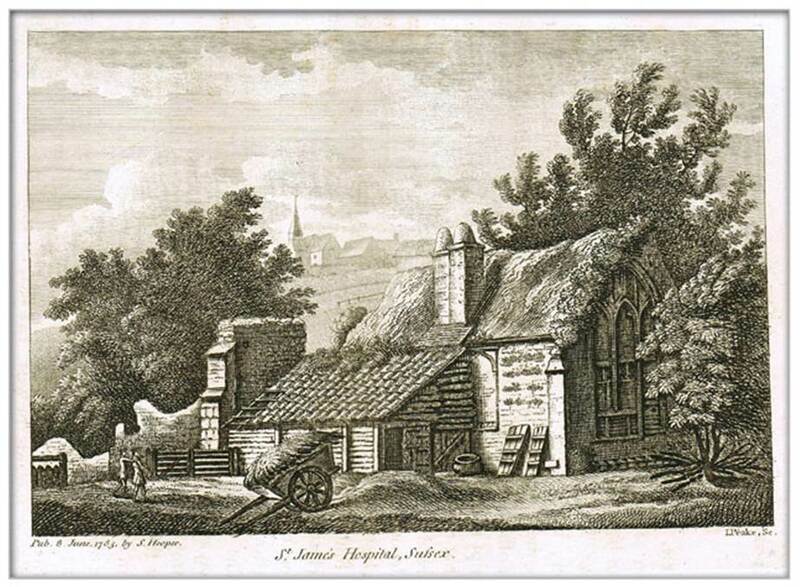 This entry was posted in Art & Architectural History, Lewes, Local History, Transport History. Bookmark the permalink.